WTS-LA is a leader in supporting and mentoring the next generation of transportation professionals in Southern California. For over 29 years, we have awarded scholarships to deserving women entering the transportation field. In just the past six years, our chapter has awarded over $225,000! 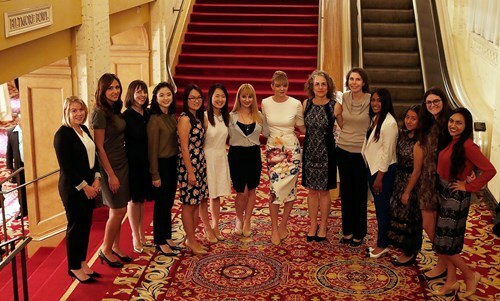 In 2017, the WTS Los Angeles Scholarship Committee oversaw the distribution of more than $70,000 in competitive academic scholarships to women in high school, certificate, undergraduate, and graduate programs in transportation-related fields, including transportation engineering, planning, finance, or logistics. Learn more about our community college, undergraduate, and graduate-level scholarships here. Our annual scholarship program provides significant financial support to students seeking assistance to cover rising education costs. Help WTS-LA raise and award over $70,000 this year in scholarships for high school, community college, undergraduate, and graduate students! Give a scholarship in your name (corporate, agency, or individual) and help choose the winning candidate – or establish an award for multiple years). All donors of any amount will be recognized as contributors to the existing scholarships listed below. HIGH SCHOOL – $2,500 scholarship awarded to high school seniors. A minimum $2,500 annual commitment is required to name a separate scholarship in this category. COMMUNITY COLLEGE/TRADE SCHOOL – $3,000 scholarship is awarded to students in community college or trade school. A minimum $3,000 annual commitment is required to name a separate scholarship in this category. UNDERGRADUATE – First-place scholarship is $10,000; second place is $7,500. A minimum $5,000 annual commitment is required to name a separate scholarship in this category. GRADUATE – First place scholarship is $10,000; second place is $7,500.